Did you know that most plant problems are not the result of disease or insects? But differentiating between a disease, a pest, or a disorder to correctly treat the problem can be a real challenge. Last year’s popular keynote speaker, Dr. Linda Gilkeson, returns to the Master Gardeners Annual Gardening Workshop on October 20th. Her first session, “Do You Really Know What the Problem Is?” will help you learn how to sort out symptoms and diagnose plant problems. Her second session, “Common Pests, Diseases and Disorders of Fruit,” reviews the prevalent apple, pear and berry problems, and provides detailed treatment information. And because she loves the Brassica family, her third session, “Of Cabbages and [January] Kings,” delves into why these delightful vegetables are a pleasure to grow year-round, and which varieties do well in our climate. 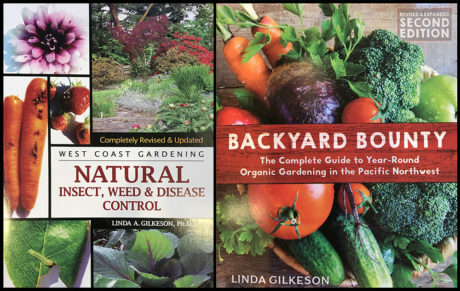 Dr. Gilkeson is an entomologist and the author of “Backyard Bounty,” the popular guide to year-round harvests, and “Natural Insect, Weed, and Disease Control.” Signup for her monthly newsletter at lindagilkeson.ca. The Annual Gardening Workshop is a day-long event, with noted authorities speaking on a wide variety of topics of interest to PNW coastal gardeners. This year our keynote speaker is the respected author, speaker, editor and ‘horticolorist’ Lorene Forkner Edwards. The author of five gardening titles including the bestselling “Handmade Garden Projects” and the “Timber Press Guide to Vegetable Gardening: Pacific Northwest.” Lorene is the editor of Pacific Horticulture, a magazine that supports the power of gardens to enrich life and help heal our planet. She is passionate about personality-infused garden spaces and the beautiful, fruitful, and innovative landscapes of our region. Follow Lorene at ahandmadegarden.com and on Instagram @gardenercook. Visit GardenWorkshop.org for complete descriptions of each session and our speaker’s biographies. Multiple choices allow you to plan your day to attend sessions of interest to you. County in Cooperation with the San Juan County Washington State University Extension.